Fulfill a contract to deliver clothing goods. I've taken a contract from one of the Writ boards, an agreement to deliver Clothier goods to an interested organization. Clothier Writ's are available to anyone who completes the Clothier Certification quest. The quest can be picked off from the Equipment Crafting Writs boards once per day. If Coldharbour nor Craglorn area hasn't been visited the quest level is capped at fifth level. [verification needed — Is this still true?] 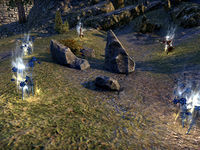 Visiting Coldharbour enables level six quests and rewards while visiting Craglorn unlocks all levels. The material required to use in crafting is dependent on the characters rank in the appropriate skill and also defines the level of the reward received. The content described here was removed from the game after one of the updates. This writ is from the (name of organisation). They need (names of items) for (purpose). Objective: Craft (names of items). Objective: Deliver Goods to (location name). Finishes quest I've placed my delivery of crafted goods into the crate. All that remains is to sign the manifest and take my reward. This page was last modified on 7 October 2018, at 16:38.